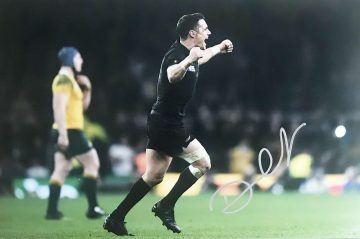 Shop our signed New Zealand All Blacks rugby shirts, balls, boots, photos and other autographed memorabilia. Many of these items come with photo proof. All come with a Certificate Of Authenticity, fast worldwide shipping and Free UK delivery! New Zealand All Blacks are arguably the most formidable and successful rugby teams of all time. As New Zealand’s national rugby union team, they have represented their country with pride for well over 100 years. The importance of rugby in New Zealand is not to be underestimated. It is considered the country’s national sport, played by over 150,000 people nationwide. Passion and support for the All Blacks are understandably high – as the team are a great source of pride for the region. 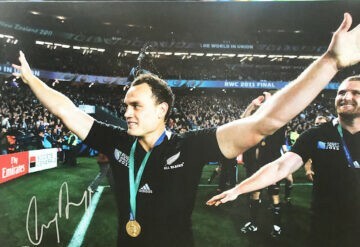 As one of the most celebrated and respected national rugby teams globally, it comes as no surprise that New Zealand’s’ rap sheet is brimming with triumphs and achievements in various tournaments and championships worldwide. They are currently ranked as the number one rugby team in the world according to the World Rugby Rankings – having only ever dropped to third place throughout the nation’s history in the sport. The All Blacks have also held the number one ranking longer than any other team. 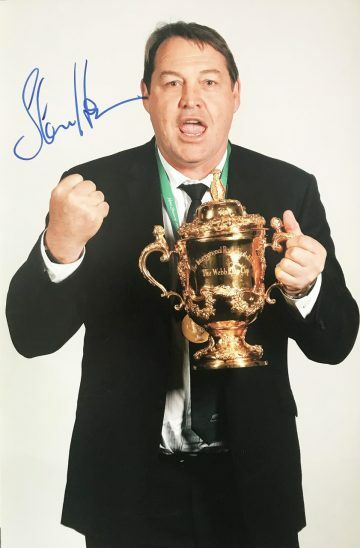 Achievements are numerous and include sixteen Rugby Championship trophies, ten ‘World Rugby Team of the Year’ awards and four Grand Slam Tours. A 77% win rate in test match rugby and the fact that they are the only team to have a win to their name against every international side makes them record breakers. 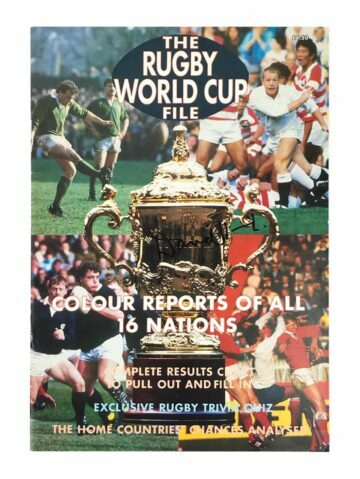 They have won the Rugby World Cup an incredible three times, having appeared just eight times since its inception. 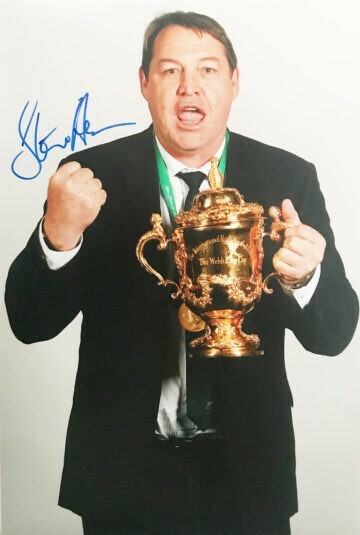 The name All Blacks may be synonymous with success – but they’re also widely known for their famous Haka performances, a traditional Maori challenge of intimidation which they carry out in front of opponents before every international match. 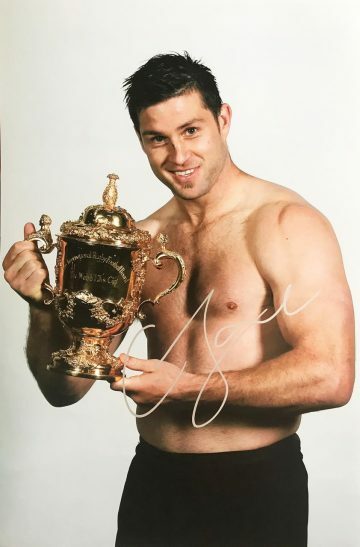 Celebrate and commemorate one of the best rugby teams in the world with our collection of signed New Zealand All Blacks rugby memorabilia. 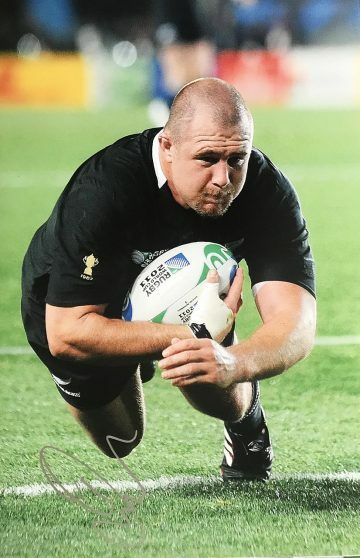 Our carefully compiled collection includes extra-special and exclusive items, including signed All Blacks shirts, shorts, boots and balls signed by All Blacks stars spanning the decades. Each of our items is supplied with a certificate of authenticity as provenance. These fantastic finds make excellent gifts, brilliant talking points or simply offer an opportunity to own a slice of the action.